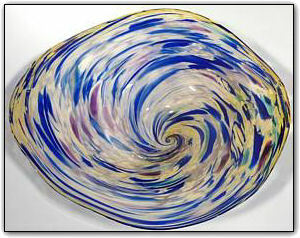 This wallbowl features an incredibly elegant color combination of blue, white, and beige along with subtle purple highlights swirling throughout. The contrast of the darker and brighter blues & purples provides the perfect contrast for the subtle and gentle background of white & beige. Wallbowls can be hung on a wall just like a picture or they can also be set out as a table bowl as well. To hang the bowl on a wall, all you need is a secure hook on the wall and a hanging apparatus comes along with the bowl. Hanging the bowl is a breeze and should take less than 10 minutes. You won't believe the compliments you are sure to receive when displaying this elegant wall bowl!